Portfolio – MER Engineers, Inc. 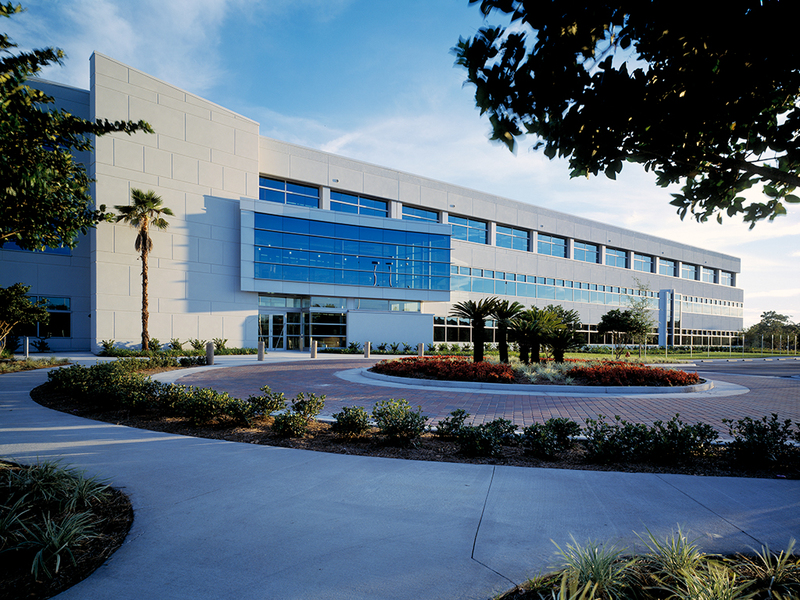 Utilize an extremely intricate process to construct this 116,367-square-foot five-story facility. The owner selected Tilt-Up because of its load-bearing capabilities, hurricane-resistance and architectural appeal. Two interior shear wall panels, each four stories high, were lifted into place. 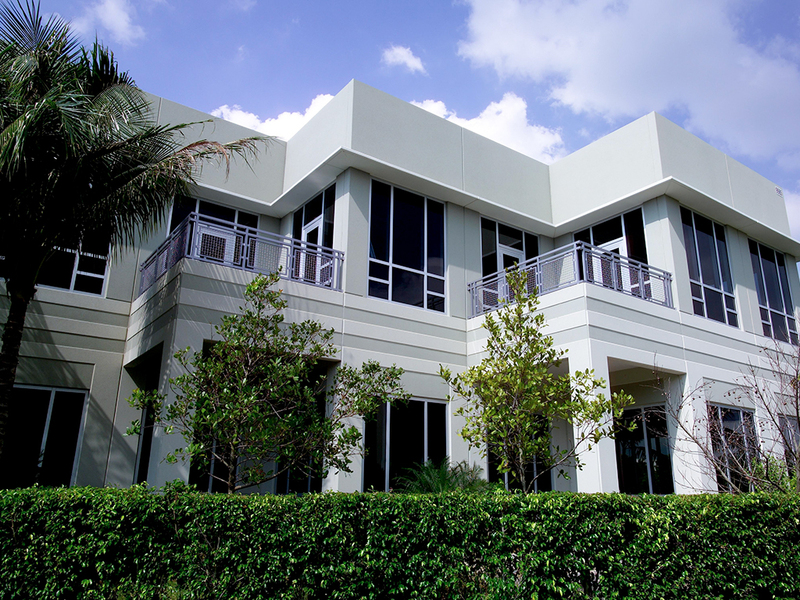 After the exterior three-story panels were erected, the steel contractor installed the columns, beams and fourth floor deck. The contractor then poured the fourth floor concrete, which was followed by the erection of the second-tier panels. An additional 15 panels, measuring 18 feet by 26 feet and weighing 60,000 pounds each, were lifted into place by a crane to add the fourth and fifth stories. Curtain wall features on the corners, front and rear of the building add visual appeal to the structure. The large glass area and specialty splatter coat that emulates stone are striking. A creamy neutral color scheme complements the existing facilities. 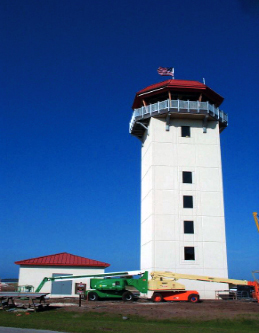 Although the project was constructed during a particularly active hurricane season in which Florida experienced an unprecedented four hurricanes, no panels were lost or damaged because of the engineer and contractor’s bracing expertise and attention to detail during preparation for the storm. 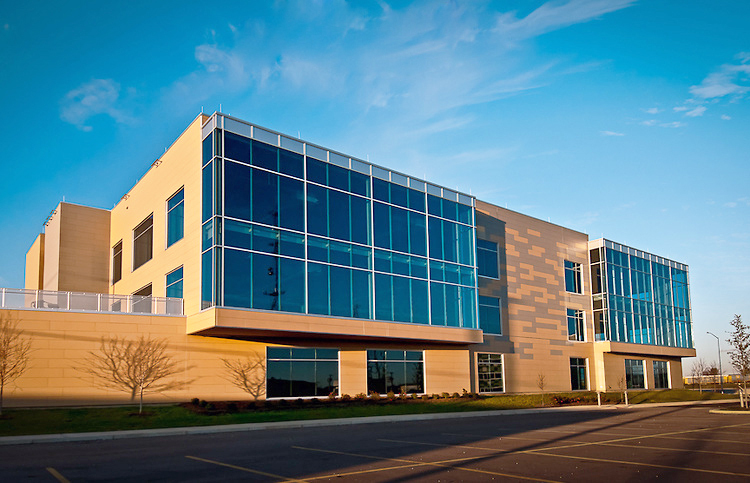 This project was a 2006 Tilt-Up Concrete Association (TCA) Achievement Award Winner in the Office category. It was one of the first five-story Tilt-Up buildings in the United States. 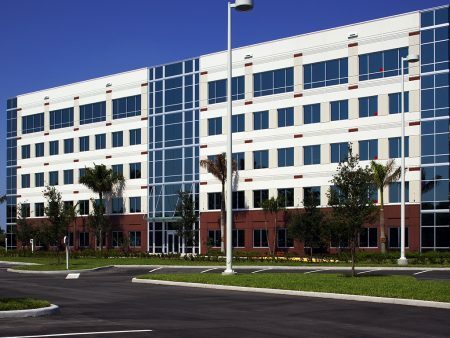 Provide tilt-up cost saving alternative to steel moment frames and precast concrete panels at multistory office building to resist significant seismic forces while meeting progressive collapse and blast resistance as required for GSA facilities. This project involved design and construction of one, two and three story tilt-up concrete wall panels. Special design loads related to seismic forces, blast resistance and progressive collapse made the wall design relatively complex. Worked closely with the Engineer of Record on the coordination and design of connections with their structure. 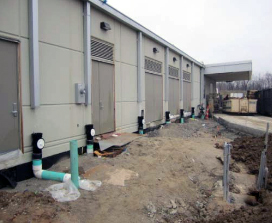 The GSA requirement for blast and progressive collapse resistance required the development of non standard panel to panel connections to resist these forces. Special load combinations were developed to address the loads induced when vertical panel support was removed from adjacent panels. Special reinforcing detailing was necessary due to seismic loads and quantity of both punched and ribbon style windows. Elimination of the requirement for perimeter steel moment frames and the use of tilt-up panel to resist lateral loads resulted in a savings to the owner of over half a million dollars. 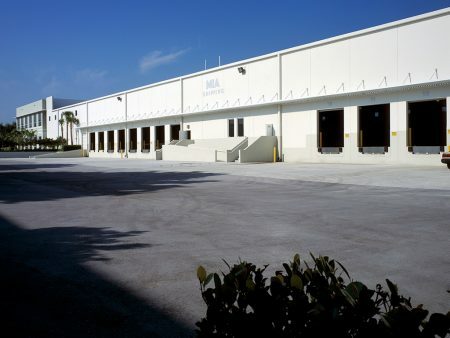 Design and construction of an 87,418-square-foot warehouse facility laden with style and flair. 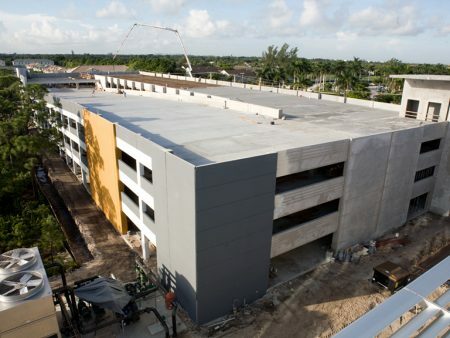 The building consists of load-bearing panels that support the precast concrete second floor and roof framing system. 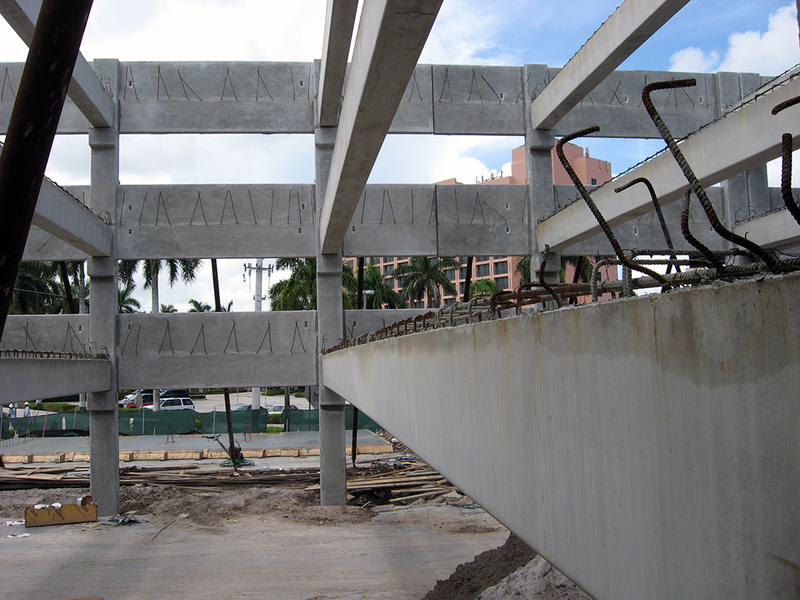 Precast double tees and beams are supported on continuous concrete haunches cast monolithically with the panels. This facility is anything but a boxy warehouse and the architectural treatments that were utilized greatly enhance the visual appeal of the building. Tilt-Up was selected for this project because of its ability to provide both a functional workplace and architectural versatility. Special attachments were designed that would not disturb the exterior features of the facility. Panels were arranged in an eye-catching stair-step pattern and balconies extend from the second floor offices. Cast-in-place concrete eyebrows and canopies were cast after the panels were erected and are supported by the panels. Many of the outside faces of the panels are 75 percent covered with reveals and recesses. Further, the visual interest is enhanced by the corner feature panel that includes a 15-foot horizontal cantilever, reveals and eyebrows on each side. This project was a 2004 Tilt-Up Concrete Association (TCA) Achievement Award Winner in the Distribution/Warehouse category. 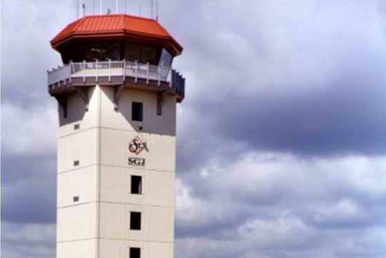 Design and construct an air traffic control tower that is durable and resistant to hurricanes while meeting demanding time schedules and budgets. The walls were divided vertically into 25-foot-by-20-foot wide panels. In addition, interior floor slabs were constructed on site and then installed during construction. Innovation was not limited to the design process, but applied during construction as well. The first four panels were tilted into place, and then two concrete floors – constructed on the ground – were slid down into place. The next four panels were then tilted into place on top of the original four panels and braced to the second floor slab. The next two floor slabs were then dropped into place prior to setting the next tier. The benefit to this system was the use of a smaller crane and braces, as the braces never had to handle more than 20 feet of panel. 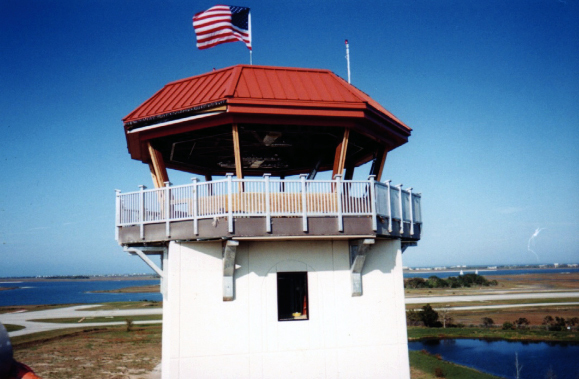 The tower was designed for maximum durability – to include a 125-mile-per-hour wind load and exposure category D with an importance factor of 1.15, meaning that this tower should not only stay intact during a hurricane, but fully operational afterwards. The control tower cab, or working floor, was designed as a space frame to allow full assembly on the ground and was then lifted into place on top of the panels. Both the owner and contractor were pleased that this project came in ahead of schedule and under budget. 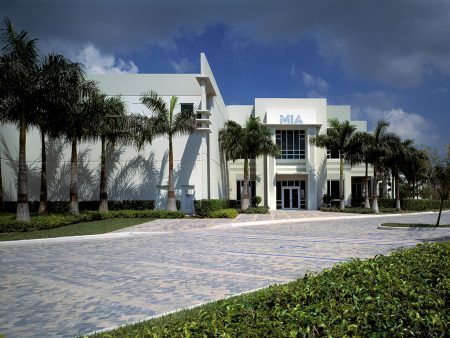 This project was a 2005 Tilt-Up Concrete Association (TCA) Achievement Award Winner in the Special Projects category. Design and construct a new three story LEED office building incorporating numerous sustainable design features. This flexible use three story office building has high floor-to-floor heights and utilizes a large amount of glass in the façade. 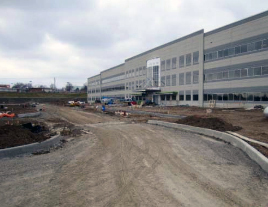 The first floor is intended to allow space for a light industrial manufacturing company or high tech development firm. The exterior façade of the building is constructed using light gauge steel framing in combination with large areas of glass curtain wall. 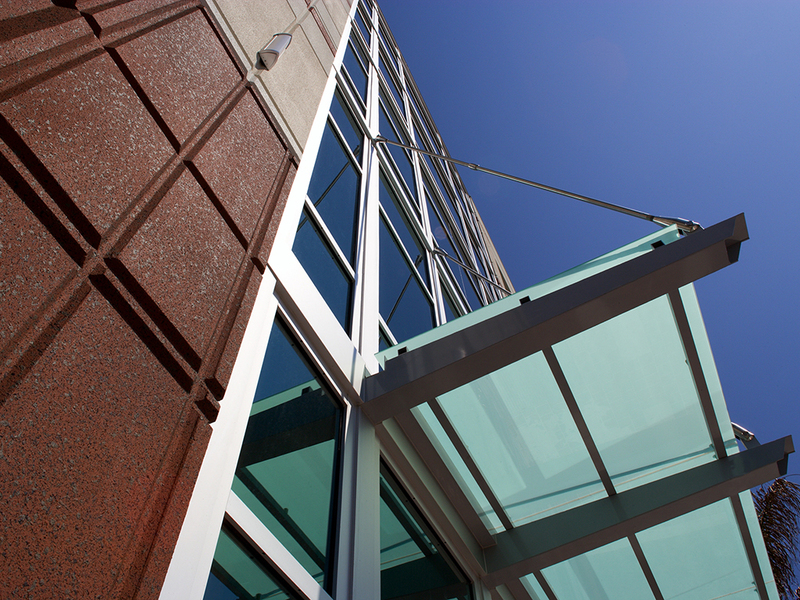 The glass enclosed three story high entrance lobby provides for a dramatic entrance to the building and the monumental stair leading to the second floor. A second floor rooftop patio/garden area provides a relaxing place to take a break or entertain. 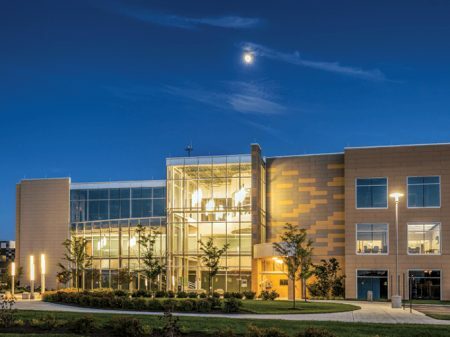 This building, a $9.1 million, 70,000-square-foot multi-tenant structure is designed as a "smart building," incorporating highly advanced technology features such as integrated HVAC systems, secure and public wireless internet connections, with a variety of ecologically friendly "green" elements incorporated in to its sustainable design. Design and build a 154,662-square-foot facility that would serve as an advanced research and development lab as well as consolidate Vistakon’s different disciplines. This project involved attaching site-cast Tilt-Up concrete panels to a structural steel frame. Tilt-Up was selected because of its ability to meet the tight schedule and cost constraints. Also, Tilt-Up offered the same architectural appeal as the precast design. This building was originally designed as a precast building, but by switching to a steel-framed building with Tilt-Up cladding, the design and construction team was able to expedite the schedule. The structure was planned to allow maximum flexibility since the ratio of lab to office space varied significantly from group to group. The flexible space allows the “double-stack” of laboratories to convert to a combination of lab and open office space where appropriate. Panels had to be set-up, bolted and welded before they could be released by the crane. Further, because of their size and magnitude, the panels were erected on top of each other. 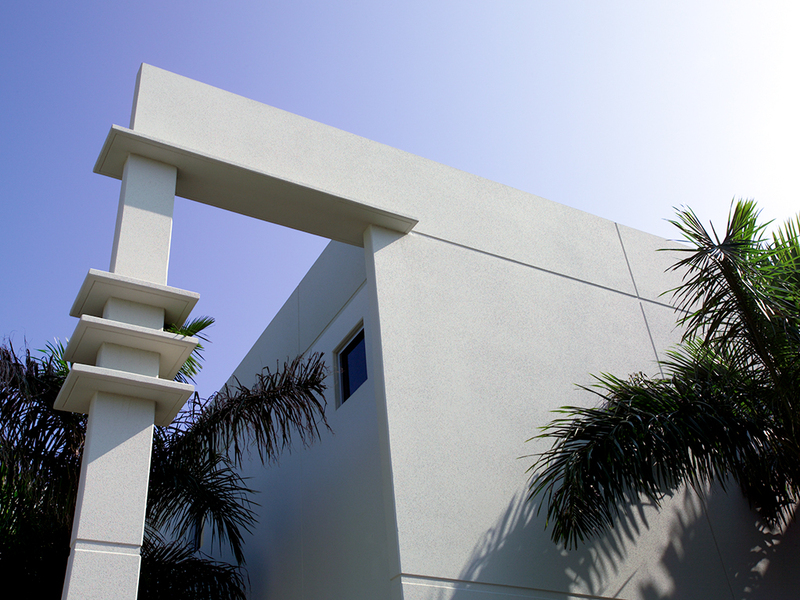 A decorative form-liner lines the top portion of the panels around the entire three-story building. 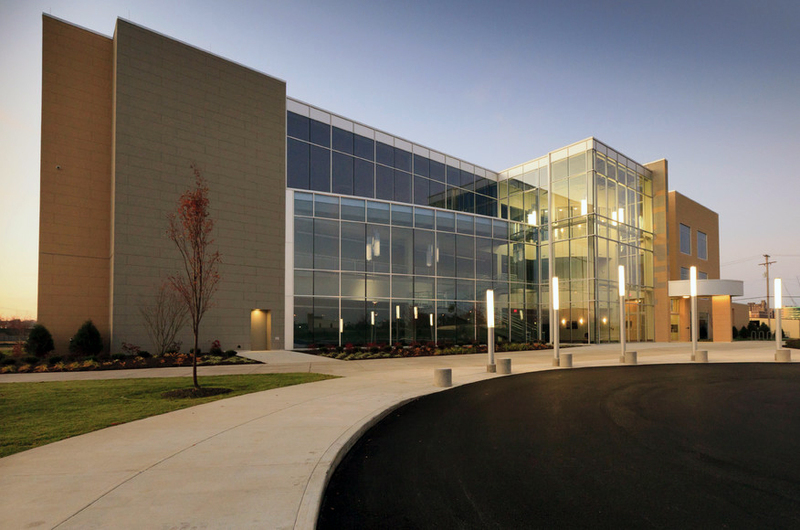 White concrete is accented by a blue-tinted glass to give the facility a modern look. 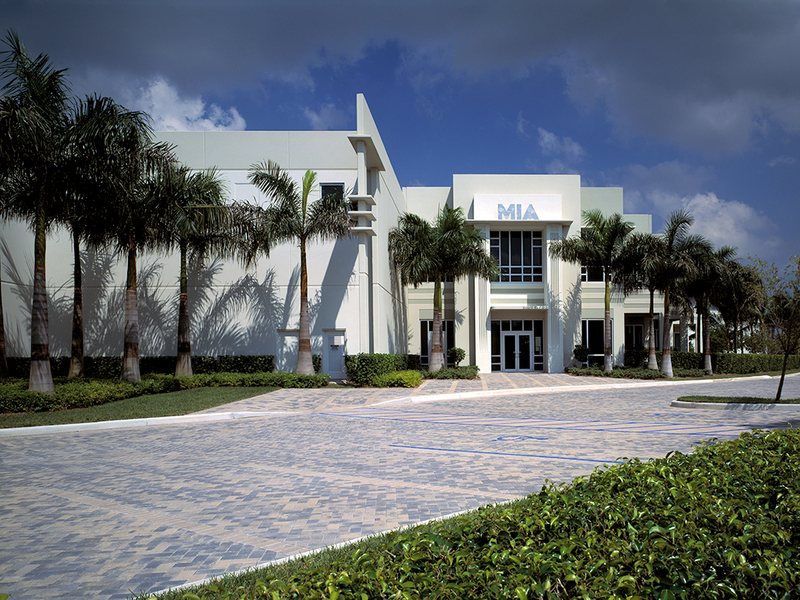 This project was a 2004 Tilt-Up Concrete Association (TCA) Achievement Award Winner in the Manufacturing/Industrial category. 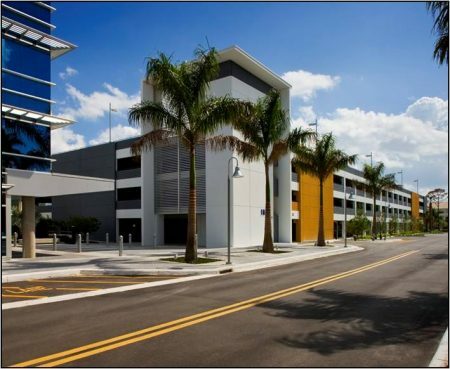 Design and build a four story parking garage capable of parking 543 vehicles that would complement the adjacent 4 story tilt-up office building. This project involved design and construction of a four story parking garage constructed using tilt-up concrete bearing walls, precast concrete columns, precast-prestressed floor beams and cast in place supported concrete floor slabs. This parking garage is unique in that all of the concrete members were cast on site. This included the precast beams and columns which are typically plant cast. The exterior walls of the garage were constructed using tilt-up concrete wall panels which combined the columns and spandrels into a single panel, thereby eliminating steel connections that are normally required to connect these items. 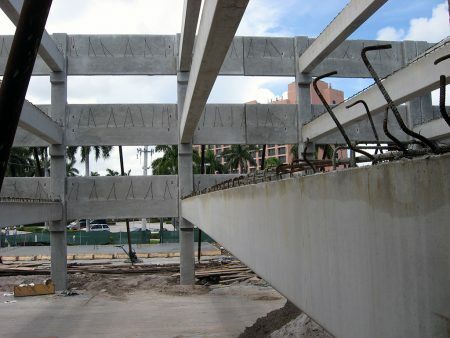 Lateral loads were resisted by large tilt-up shearwall panels that were tied monolithically to large foundations through the use of wet cast concrete joints between the foundation and wall panels. In some cases multiple adjacent panels were connected together to act monolithically, also through the construction of a wet cast concrete joint between the panels. 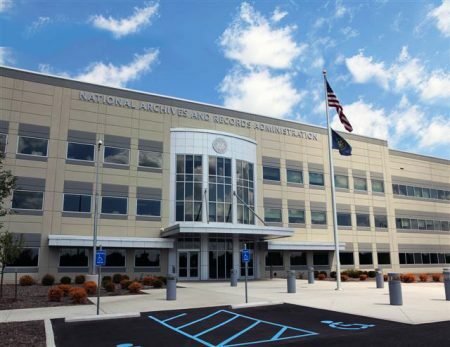 Architectural interest was achieved by recessing some panels behind adjacent walls to create shadow lines and depth to the outside of the building. 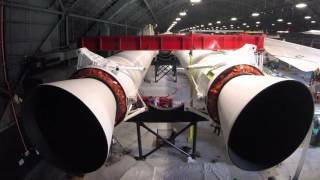 Time-lapse of the Titan IVB stage one, and the two solid rocket motor upgrades(SRMU's) being raised into their final position on a 10 foot stand.